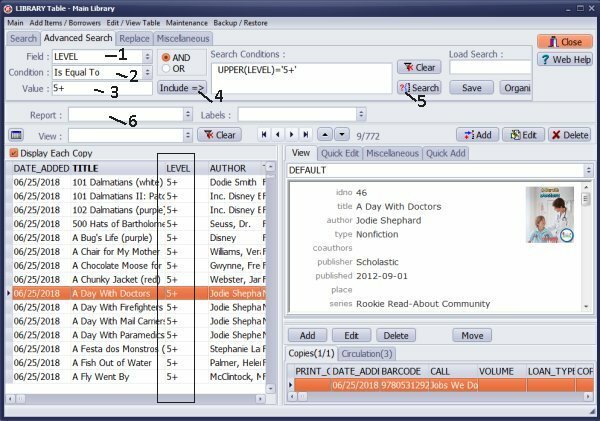 ﻿ Handy Library Manager: How to print the list of books that have a specific reading level, grouped by category? 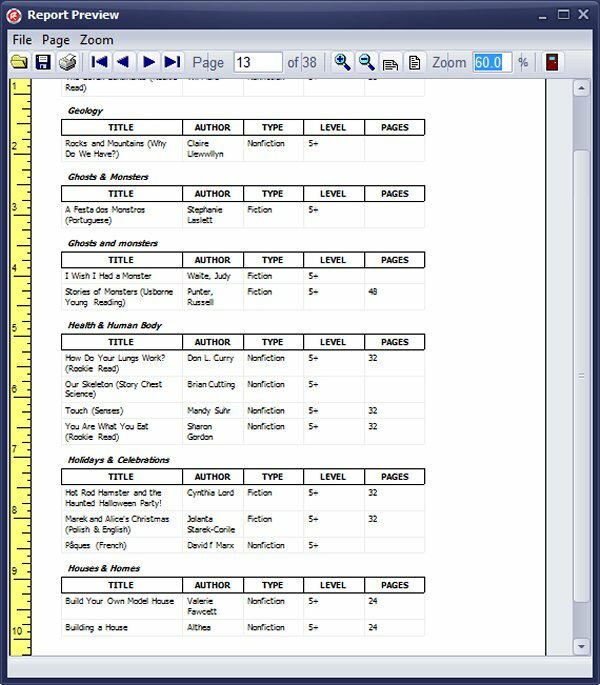 Help, how to topics > Print reports > How to print the list of books that have a specific reading level and books are grouped by category? How to print the list of books that have a specific reading level and books are grouped by category? Sometimes librarians want to create a simple list report with items from one group (one category, one reading level, one subject, one grade, or age level). In this report sample we will show how to create a list of books with the reading level equal 5+. Items in the report will be grouped by category. The report will include book title, author, book type, level, and number of pages. The report will be created in two steps. In the first step we will define the search to display only books that have the level 5+. The report will be defined in the second step. The reading level value is stored in the LEVEL data field. Click the Advanced Search tab to define the search. Select LEVEL in the Field (1) box, select Is Equal To in the Condition (2) box, enter 5+ in the Value (3) box. Click Include (4). Click Search (5) to execute. Only items that have 5+ level will be displayed in the library window. Print Reports starts with 3 preselected data fields, click Red Arrow icon to remove them. Scroll down and up in the All Fields (1) box and select the following data fields: TITLE, AUTHOR, TYPE, LEVEL, PAGES. When data field name is selected in the All Fields box click Green Arrow icon to include it in the Included Fields (2) box. In the Group By (3) box select CATEGORY. In the All Fields box select CATEGORY. 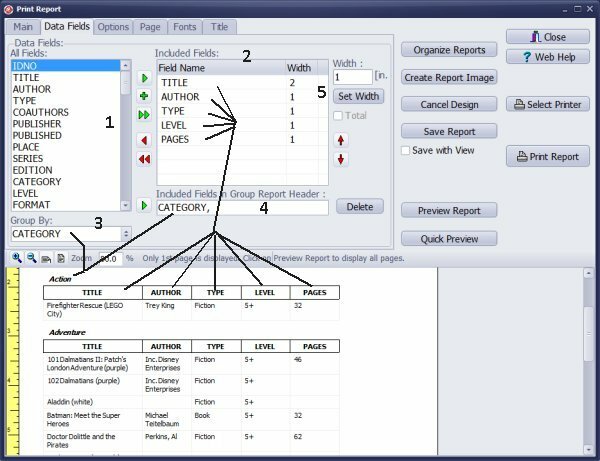 Use Green Arrow icon to include the selected field in the Group Report Header (4). To adjust the column with select the field in the Included Fields box enter the column width and click the Set Width button. Question: I am trying to generate a report for my teachers so they can see what book we have for the specific reading level. I want a report that has the books in title order grouped by CATEGORY. Answer: In the main library catalog set order by TITLE, to list items that are from one reading level define search, select New Report in the Report box, and define your report. How to print report with library items from one category, group, reading level, age group? A teacher would like to have a report of books that are for a particular age.